The meta of a competitive game is a curious thing. As balance and tactics evolve, so do the prescribed best practices for coming out on top no matter what your foes (and the greatest foe of all, life) throw at you. That’s natural. It keeps the game interesting. When one strategy becomes too dominant, however, you’ve got a problem. Is Overwatch’s “triple tank”—aka “triple tank-triple support” or “double triple”—strategy unfairly devastating? For now, that’s the big debate among Overwatch’s more strategically minded players, especially those in the pro scene. Regardless, pros and players alike level two main criticisms against it: 1) it doesn’t take a ton of skill to pull off, and 2) it’s boring to watch. If you’re trying to brew up a tasty eSports stew, those are the last ingredients you want on your list. Remember when everyone was complaining about Genji? This is what they’re complaining about now. As it currently exists, the triple tank strategy revolves around a few central pillars. Team composition is made up of three tanks and three supports. One of the tanks is usually Reinhardt, and one of the supports pretty much must be Ana. As you’d expect, having three supports provides plenty of cushion for tanks’ pushin’, allowing the big boys and girls to be more liberal with their offense. 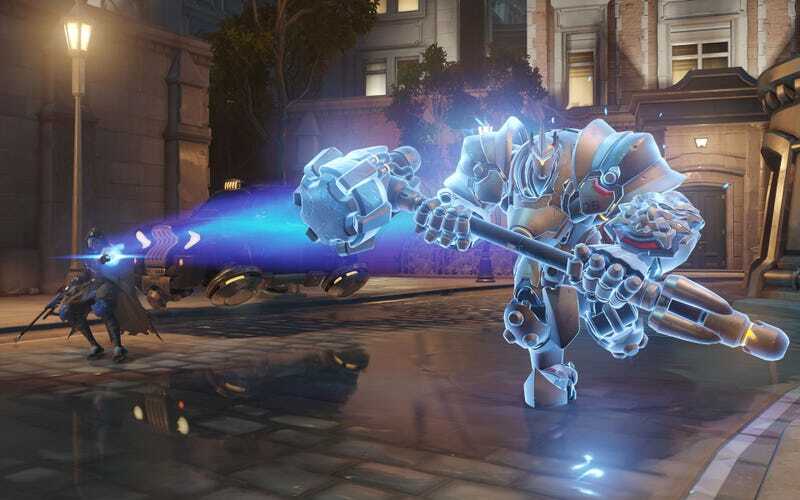 Once Ana’s ult charges—which doesn’t take much time given that she has three giant, easy-to-hit targets for her healing shots—she uses it on Reinhardt, transforming him into a roaring engine of pure destruction. Often credited to pro team NiP, the strategy has become especially prevalent in pro matches and the mid-to-upper echelons of Overwatch’s competitive mode. It’s reliant on the fact that tanks are hella survivable, anti-tank characters aren’t doing so hot these days (see: Zenyatta’s nerf, Pharah’s lack of viability against D.Va’s revamped defense matrix, Zarya just as, you know, a concept, etc), and Ana’s ult is a fantastic stalemate breaker. Bischof argued that Ana needs to be nerfed, and something needs to be done to non-tank DPS heroes. It’s not that they’re weak, he said, but they hit a (sort of literal) wall against three tanks. Of course, nerfing Ana and buffing DPS heroes might just slam the see-saw in the other direction—especially in regard to anyone playing Ana basically ever—so that might not be the most elegant solution. Plus, DPS heroes have a history of being annoyingly powerful. McCree and Genji immediately spring to mind. Many players have also pointed out that triple tank violates Overwatch’s holy trinity of twos: two tanks/two offense/two healers. It’s not, in other words, a “standard” team composition. Why put multiple roles into the game, after all, if players are only gonna use two of them to fill out a full six-person team? Others, however, consider that a plus. For the first time, a non-standard, more creative composition is the de facto Overwatch strat. It might not be the most exciting strategy to watch, but it shows that the game’s roles have versatility, that the meta can evolve in unexpected directions. In some ways, that bodes well for the game’s pro scene, which is still trying to find its legs. As a result, some argue that calls for nerfs, buffs, and the many other moves of the razor’s edge balance tango are premature. Competitive season two hasn’t been running for long, they say, and the pro scene is still in its infancy. The mark of a good competitive game is a meta that evolves organically, not because a developer decided to cudgel it into a different shape. Tempo Storm started strong, but Kongdoo managed to find repeated success. Predictably, pressure on Ana seems to be key. It’s not easy to dislodge her from a sardine tin of tanks, but it is possible.